Chilaca is the name of the fresh pepper and Pasilla is what the dried form is called. The Mexican native has a slightly sweet, rich flavor that is used in mole sauce. The 9 inch long fruit starts out dark green and then ripens to a dark brown earning the name Pasilla when dried which means little raisin in Spanish. Compared to the Habanero (215,000 Scovilles) this pepper is relatively mild rating 1,000 to 2,000 Scovilles. 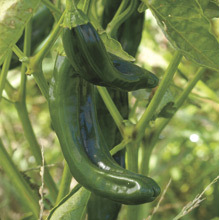 Outstanding Features: Mild to medium-hot pepper.